To mark the arrival of the Virtual Console on the Wii U, Nintendo has launched a very generous promotion to mark the 30th anniversary of the Famicom (the Japanese version of the NES, in case you were wondering). What this promotion entails is the release of seven classic Nintendo games on the Wii U over a period of seven months for the absurdly low price of $0.30/€0.30/£0.30 for 30 days after they drop. The first game to appear is the ever-popular Balloon Fight, an arcade title that has been released time and time again in several different iterations on various gaming platforms, most recently including Balloon Trip Breeze from the Nintendo Land suite of games. Suffice it to say, it’d be an impressive feat if you’ve managed to not play some form of Balloon Fight by now. Before you play, there are two different game modes to choose from: the main game, and a secondary quest titled Balloon Trip. The main game, which actually fits the titular description of “balloon fight,” has you floating around the screen with balloons attached to your back while trying to pop the balloons attached to enemy characters, sending them plummeting to the ground. Knock out all of the on-screen enemies before they take you out and you get to move on to the next stage. This game mode can be surprisingly difficult, but it also allows for a second player to join in the fray, either helping or hindering your progress. 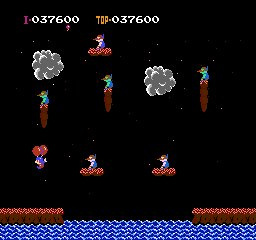 It’s an incredibly simple concept that has been reproduced countless times, and like many of the early NES releases, Balloon Fight is reflective of arcade games in that your goal is focused on achieving the highest score possible rather than advancing through any sort of linear objective. Though the game is simple and your goal never changes, the challenge stems from the number of enemies on screen and the obstacles that stand in your way. 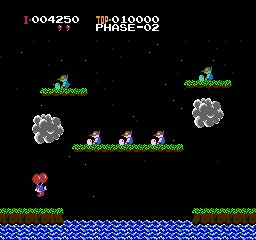 As you advance and continue moving towards increasingly difficult stages, more enemies will appear and more platforms will block your path of flight. There are also a number of different hazards that will vie to take your life, including clouds that project lightning your way and bodies of water full of very hungry fish that must be avoided. 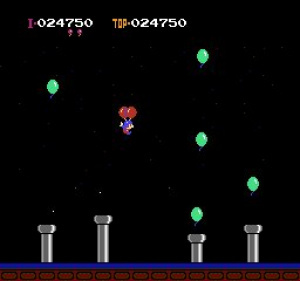 Balloon Trip, the second game mode, has you floating from right to left on a continuous course dodging obstacles and collecting balloons for bonus points. Much like the main game, it’s all about earning a high score rather than working toward a tangible end goal. While this mode does add a bit of variety from trying to climb level after level, it still lacks the inherent diversity in gameplay that makes most games so engaging. The simple gameplay in both modes, while enticing for folks looking for a game with an arcade feel, is also the double-edged sword that will draw some players in while simultaneously pushing others away. Both modes, while different in execution but very similar in style, are played simply by guiding your character around the screen with the D-Pad and either mashing A or holding B to propel yourself forward. Owners of the Pro Controller also have the option of using that as their primary device, and adding a second player, as is the case with most Wii U games, requires the addition of a Wii Remote. While the controls are not the tightest in gaming history, they do well to reflect the sluggish experience of trying to pilot yourself if balloons were carrying your weight. Though tighter controls are always a positive, the poor design here can easily be attributed to the developers wanting to make for a more genuine experience regarding movement, but that’s a generous assumption to make. Whatever control scheme you choose to use, tapping the GamePad’s touchscreen will open up the Virtual Console menu where you can create a restore point in your game, a favorite feature of many modern gamers. Another feature of the Wii U that tends to be standard with many releases thus far is the inclusion of off-screen play, which here allows Balloon Fight to be played entirely on the GamePad’s small screen. You can also access Miiverse from the GamePad while playing, making it easy to brag and show off your high scores. There are no online leaderboards integrated directly into the game, as this is a simple port, but being able to share screenshots of your score on Miiverse –as many players have already done — proves to be a worthy substitute. It’s also worth noting that, even for an NES game, the graphics are not on par with some of the more fleshed-out titles, and look a bit bland. The character sprites are detailed enough to differentiate yourself from your enemies, but everything looks very simple and plain, and the environments aren’t even the least bit impressive. Much the same can be said about the soundtrack which is a classic at this point, but that doesn’t make it any less repetitive. Balloon Trip is an old game, and its age is starting to show. While it's an entertaining game that showcases the simplicity of many classic arcade titles that found their way onto the NES home console, it also has the kind of repetitive gameplay that can become tiresome sooner rather than later. While this Wii U re-release is a suitable port of the original with the much-appreciated additions of off-screen play, Virtual Console restore points, and Miiverse integration, it’s a difficult recommendation for new audiences who weren’t around to enjoy it when it was originally released. Balloon Fight attempts to fly high, but you can't help feeling that it's just full of hot air. One of my favourite NES games. And in response to the second last sentence, it's a pretty easy recommendation for anyone at the price of $0.30 it's currently going for. I love the music of Ballon Trip Breeze on Nintendoland! -1 point in PAL territories? 30 cents, still worth it, even with the 50hz thing. I've never even heard of it before this (thought Nintendo Land made it up as a minigame). Shows how much attention I pay to the world. @Prof_Clayton How could you have never heard of Balloon Fight. Its a popular Warioware game. I like the Modest Mouse song reference in the title. Can we get a seperate review with a lower score for European version of the game. Because it damn well isn't the same. You'd be an idiot to not buy it for 30p but you'd be a bigger idiot to buy it for £4.50 next month. Well worth 30p, thanks Nintendo! Balloon Fight is really good fun for short play sessions. For upcoming VC releases I think the user interface, being able to play on the gamepad, ability to re-map buttons, save states, and Mii-verse integration all add value to each game. It's seems a no-brainer to get all of 7 these 30p releases, even though i have most of them already - several times in some cases. I played Balloon fight for a few minutes the other night. I'll admit, it's a little more fun when played with a friend. Sadly, Nintendo decided to use scaling rather than the square pixels like the Wii VC titles have. Retro consoles are 240p by default, which scales flawlessly to 480p and 720p with integer ratios. I prefer the square pixels for emulated games as it showcases the sprites more clearly, but a lot of people may disagree, prefering a blended look. To me, it makes the sprites look blurry. An option to control the scaling method would have been nice. I was talking to a buddy of mine and he said he wasn't going to bother with this since he already had it on 3DS. I told him "I'd rather have another copy of Balloon Fight than thirty cents." He said "Good point" and downloaded it. I disagree. I enjoyed this little NES game and I think it should be an 8. No way this game's a 5. Deserves at least a 7 rating or higher. yes but, is it worth 30 cents? i'm just not sure if i'm willing to pay so much money! If you grew up playing Joust, you'll enjoy Balloon Fight. Besides, it costs less than a cup of coffee, tea, or soda. Those birds are very angry. (See what I did there)? Hm. I think it deserves a 6 or 7, but I see your point, it does get boring fast sometimes. 5 seems a bit harsh but it really wouldn't be worth the full price so I guess it's understandable. However at 30cents it's a steal. @BaronRudydog And we'll all float on okay, and we'll all float on alright. I would give it a 7 because it's 30 cents right now.. Otherwise, yeah, it's overpriced. I'd play this game endlessly if they figured out what they were doing with their online. When Iwata mentioned posting high scores to Miiverse, I literally sighed. They have every opportunity to integrate a leaderboard into the overlay since they're re-doing every virtual console game to work with WiiU, and they just aren't going to do it because for some reason online games for Nintendo are just out of the question. @LEGEND_MARIOID 4.49 for Master Blaster is a STEAL..... Though the story is silly, all that for a pet frog?!!? gimmie a break! But the game itself is so much fun. I played that game at least a month straight when I was a kid. @C7_ Are you serious? This is a NES games and you expect them to rewrite the code, just because you want a certain feature that was never apart of the original??!?! Good grief. They emulated the game exactly how it was..... Its 30 cents. If they actually rewrote the code in the game it will cost north of $15. I prefer their developers work on getting more games emulated then worrying about adding online play to Balloon Fight. Instead of getting a handful of games a week when the VC launches, we will get 1 game per 3 months because you want the code all rewritten to add online functionality. I can't believe how negative this review is. I disagree with a five-star rating 100 percent. Every one of the negative points in this article could be launched at any classic arcade game ever. Should Donkey Kong or Galaga be rated 5/10 for being repetitive? A 5/10 is a ridiculously low score for Balloon Fight, one of the best early NES titles. What a terrible review. Games like this should be applauded for their simplicity. Balloon Trip is my favorite mode and the crud it receives in this review makes no sense. Why do people still whine about scores? Seriously its just an opinion. If you love it great. No need to bash the reviewer though when he spent a lot of time and thought writing out the review. A hell of a lot more thought out then those bashing him. Why do people whine about others whining? It's just others sharing their opinion about a review, which they are fully entitled to. Speaking of which, you can also get to the save state screen by pressing ZR. Kind of useful since the Pro Controller doesn't have a touch screen. That is the reason to get this. There is none on the 3DS, but on WiiU you can play together! Co-op makes it worth getting! The review score is higher as a 2 player game than if are only playing solo. I actually quite enjoy this game. Five stars seems a bit harsh. And, agreeing with pretty much everyone so far: for thirty cents, it's a steal. I have to disagree with this one. I first played Balloon Fight 10 years ago on Animal Crossing and to this day it's still one of my favorite NES games. There's also a fair bit of replayability if you take advantage of the different modes available (Balloon Trip, 2-player). Could use a bit more variety, but I certainly wouldn't say it's aged badly. I said OVERLAY if you had read my post, something which would require nothing more than a function to check if the number obtained in the score was higher than the current number and then place it in an online leaderboard in the WiiU's interface. This would take a bit to get working but once they had a template all they would need is to make a new function for every game, which is barely any work at all since they're already re-porting everything anyway. And no, I'm not asking they do it for free, I'm asking that my extra $1 payment for every VC game go toward something more substantial than "Oh look, we integrated Miiverse (something that takes little effort because they had a template for it already as well) and you can play it on the gamepad screen." And no, this is not asking for too much because every other port I've seen that isn't on a Nintendo console has already done this. You look at Sega's ports of sonic games on XBLA and Sonic CD on steam? Leaderboards and online multiplayer, AS WELL AS button remapping, 3 "suspend points" and additional options as well. I'm not even asking for anything more than the industry standard at this point by saying that an updated high score game should have a decent way to compare high scores. In all honesty, even though it's ancient, the Miiverse integration, etc. (along with the current pricetag) makes it very worthwhile to anyone right now. If it was only a little release maybe it would be harder to recommend but it's a lot more fun when you can show off your achievement to everyone. Miiverse is something all retro titles need available. Woah! A 5/10! I thought it's a great game, especially when it's only 30 cents. This has more replay value than Super Mario Bros. It also kept me entertained for longer and has a real multiplayer mode. Its graphics are pretty much as dull as many other NES games, and it has basically two games in one. The controls are frustrating if you're new to them but mastering them requires practice, as it should in a game that's high score based. Saying that this game has aged a lot while other NES games haven't is just laughable. For the record I played no NES games in my childhood - so no, I don't have any reason to be biased about it. Come on, a 5? Seriously? This game is tons of fun, it feels good to play! It handles really well! It's addicting! What more could you ask for from a NES launch-window game? Folks, it costs 30 cents/pennies: that alone is worth recommending. And I have to admit that it's a pretty solid and fun retro game, giving the opportunity to know what Iwata was doing before he got to become the King of Nintendo. Just like most of us here in the comments I believe, I love Ballon Fight, and I thoroughly believe it deserved higher. Maybe and upgraded HD version would be good. Balloon fight HD or something like that, not just the simple port, that NES HD games would have been perfect to celebrate the 30 anniversary of the NES/Famicom. @Ron Doing reviews for retro games is an exercise in futility to me, especially when one looks at the game with 2013 eyes. Perhaps when stacked up along the likes of similar games of today this score would be apropos, but that is not how many of these games are perceived. One does not say: "Hmm, Balloon Fight or Nintendo Land?" How do you even go about it then? Compare it to games of similar price. For .30 cents, these games are 11's. If I play it for even 1 min I am getting my moneys worth. I dont think I would pay full price for this game but for 30 cents, well you cant beat that deal. I will be getting tingle's balloon fight soon, so I won't be needing any port of balloon fight. This classic's a steal at 30 cents. Come on guys it's utter poo and it was pretty poo when it was first released. I speak as an old NES owner who enjoyed many other launch titles over this. In fact, its worse than many C64 games I used to play around the same era. 3p would be too much. Easily my favorite NES game. Already have it on my 3DS but it was worth it to get it again for the multiplayer. This is an out rage! Oh wait we're fighting about 30 cent NES game, and here I was hoping for a real argument. By the way, great review Ron. Barely played this from the ambassador games just didn't find it very engaging. Wow is this argument really happening? I won't bother, I have better things to do. @Boo_Buster I don't disagree, but you have to keep in mind that, as this is a review of the version of Balloon Fight that was recently launched on Wii U, Nintendo's newest console that has been on the market for less than three months, this review is intended for people who haven't had the opportunity to play the game yet. If you've played Balloon Fight before, then you know exactly how you feel about the game, and you probably decided whether or not you were going to purchase it on Wii U before you even read our review. That being said, I did review this game from the eyes of someone playing games in 2013, because we're living and playing games in 2013. 25 years ago Balloon Fight may have been received better, but the standards were different then. Per our Scoring Policy, a 5 is an average game. It's not awful. It's not even bad. It's a functioning game that is entertaining for a while, but it's hindered by its age and the technology available when it was being made. If the game had been updated in some way (better graphics, tighter controls, online leaderboards, more play modes) for this rerelease, then the score would be different, but that's not the case. And regarding the price, it's an excellent deal, but that in no way alters the quality of the game. There is a plethora of free games available online, on mobile phones, and on other platforms, but so many of them are absolutely terrible. Just because a game is free or inexpensive doesn't mean that it's any good. I try to leave the price of a game out when writing a review because that shouldn't be what matters (I know I mention the price in the first paragraph of the review, but that's simply to bring attention to the promotion from Nintendo, not to imply that it has anything to do with the final score). This is based on the quality of the game itself. WERE GOIN TO GOLDEN CORRAL! @Reala The 3DS version doesn't have multiplayer, and that's what makes the main game fun. I love this game, but only find 2-player mode and Balloon Trip to be entertaining. Well said Ron. Judge it for what it is. Not whatever price it is. I only have .02 cent left from getting Little Inferno a while back. "Boooo!" XD When does it go for full price?? I have this on both my 3DS and Wii U and I would give it an 8/10. The only thing that bugs me is that music. What were they thinking? Hmm, I was expecting a higher score. This is one of my favorite NES Ambassador Games on my 3DS. The game is ok. 50hz is a problem. I hope the n64 games aren't in 50hz. For those of you that have it on your 3DS.......you guys got that copy for FREE (unless I'm missing out on something?). If I had that opportunity to get that at 30 cents too on a home console, it's a no-brainer to drop the money that would have cost you 3 phone calls back in 1985! @Blizzaga It got 5/10 when it was reviewed in 2007 for £3.50 on the Wii VC. It's addictive but far too basic to warrant real money being spent on it unless you're a nostalgia addict. Well, I can't call myself a nostalgia addict, because this is my first time ever really getting into the game. It deserves way more than a simple 5. The only thing I could see it getting docked for is the noises from the first two modes. But Mode C, Balloon Trip, is pure bliss. The whole game is quite addictive to me. Terrible game. And I was there when this was first released. Wasn't a fan then and still not. My suggestion is to save your .30 cents and download some music instead. Well, I do like Balloon Trip. Tried it on the 3DS VC. What I can't understand is why Nintendo of America hasn't updated that game (as well as a few others) on the 3DS to support simultaneous multiplayer. I mean, Japan has it. I think NOA needs to take a few lessons from the guys in Japan. One of the many problems with a review system is how you define 'average'. Does that mean 'not bad, but not that good either' or does it actually mean average? The average game that gets reviewed on this site is at least good. The average score given on this site is around a 7, not a 5. I happen to be a right between the old/new gamer player. But, I found this game to be awesome. @BenAV this game is cheaper than a pack of wrigley's juicy fruit. so yeah, how can you go wrong? i would wait for titles like mario 1 and mach rider (i would buy it to play and make fun of it). 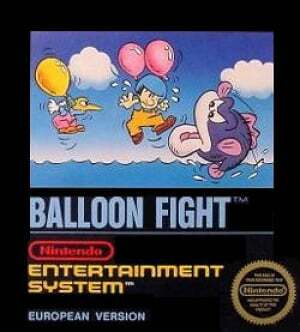 balloon fight reminds me too much of the 80s as it is just too stale a game today. it has aged poorly. @Myself I will be getting this on the 3ds as well.